Pump not reachable. What to do? Always carry the smartphone with you, leave it next to your bed at night. Always make sure that the pump battery is as full as possible. See the battery section for tipps regarding the battery. It is best to not touch the app ruffy while the system is running. If the app is started again, the connection to the pump can break off. Once the pump is connected to ruffy, there is no need to re-connect. Even after a restart of the phone, the connection is automatically re-established. If possible, move the app to an unused screen or in a folder on your smartphone so you do not accidentally open it. If you unintentionally open the app ruffy during looping, it’s best to restart the smartphone right away. Whenever possible, only operate the pump via the AndroidAPS app. To facilitate this, activate the key lock on the pump under PUMP SETTINGS / KEY LOCK / ON. Only when changing the battery or the cartridge, it is necessary to use the pump’s keys. In AndroidAPS, go to Settings / Local Alarms and activate alarm when pump is unreachable and set pump not reachable limit [Min] to 31 minutes. This will give you enogh time to not trigger the alarm when leaving the room while your phone is left on the desk, but informs you if the pump cannot be reached for a time that exceeds the duration of a temporary basal rate. When AndroidAPS reports a pump unreachable alarm, first release the keylock and press any key on the pump (e.g. “down” button). As soon as the pump display has turned off, press UPDATE on the Combo Tab in AndroidAPS. Mostly then the communication works again. If that does not help, reboot your smartphone. After the restart, AndroidAPS and ruffy will be reactivated and a new connection will be established with the pump. The tests with different smartphones have shown that certain smartphones trigger the “pump unreachable” error more often than others. AAPS Phones lists successfully tested smartphones. On phones with low memory (or aggressive power-saving settings), AndroidAPS is often shut down. You can tell by the fact that the Bolus and Calculator buttons on the Home screen are not shown when opening AAPS because the system is initializing. This can trigger “pump unreachable alarms” at startup. In the Last Connection field of the Combo tab, you can check when AndroidAPS last communicated with the pump. 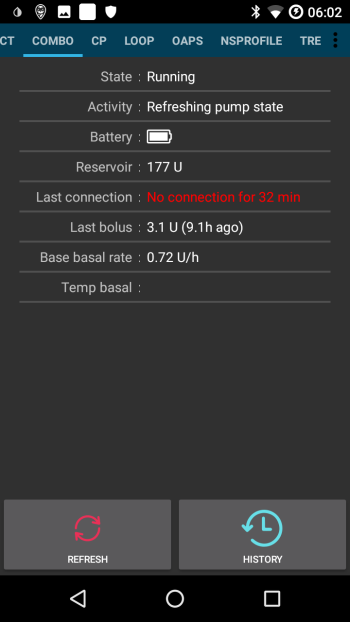 This error can drain the pump’s battery faster because the basal profile is read from the pump when the app is restarted. It also increases the likelihood of causing the error that causes the pump to reject all incoming connections until a button on the pump is pressed. Occasionally, AndroidAPS can not automatically cancel a TBR CANCELED alert. Then you have to either press UPDATE in the AndroidAPS Combo tab or the alarm on the pump will be confirmed. After a low battery alarm, the battery should be changed as soon as possible to always have enough energy for a reliable Bluetooth communication with the smartphone, even if the phone is within a wider distance of the pump. Even after a low battery alarm, the battery might be used for a significant amount of time. However, it is recommended to always have a fresh battery with you after a “low battery” alarm rang. To do this, long-press on Closed Loop on the main screen and select Suspend loop for 1h. Wait for the pump to communicate with the pump and the bluetooth logo on the pump has faded. Release the key lock on the pump, put the pump into stop mode, confirm a possibly canceled temporary basal rate, and change the battery. Then put the pump back in run mode select Resume when lon-pressing on Suspended on the main screen. 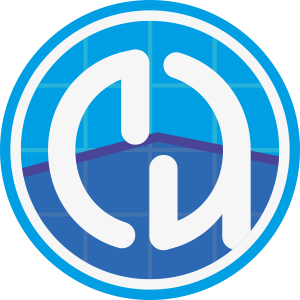 AndroidAPS will re-set a necessary temporary basal rate with the arrival of the next blood sugar value. As intensive Bluetooth communication consumes a lot of energy, only use high-quality batteries like Energizer Ultimate Lithium ,the “power one”s from the “large” Accu-Chek service pack, or if you are going for a rechargeable battery, use Eneloop batteries. 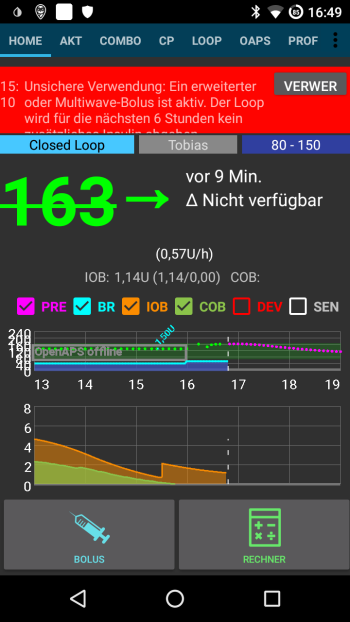 Die latest version (March 2018) of the ruffy App significantly improved pump battery lifetime. Make sure you are on that version if you have issues with a short battery lifetime. There are some variants of the screw-on battery cap of the Combo pump, which partially short circuit the batteries and drain them quickly. The caps without this problem can be recognized by the golden metal contacts. If the pump clock does not “survive” a short battery change, it is likely that the capacitor is broken which keeps the clock running during a brief power outage. In this case, only a replacement of the pump by Roche will help, which is not a problem during the warranty period. The smart phone hardware and software (Android operating system and bluetooth stack) also impact the battery lifetime of the pump, even though the exact factors are not completely known yet. If you have the opportunity, try another smartphone and compare battery lifetimes. Currently the combo driver does not support automatic adjustment of the pump’s time. During the night of a daylight saving time change, the time of the smartphone is updated, but the time of the pump remains unchanged. This leads to an alarm due to deviating times between the systems at 3 am. If you do not want to be awakened at night, deactivate the automatic daylight saving time changeover on the mobile phone in the evening before the time changeover and adjust the times manually the next morning. Input the carbs but do not bolus for it. The loop algorithm will react more agressively. If needed, use eCarbs (extended carbs). 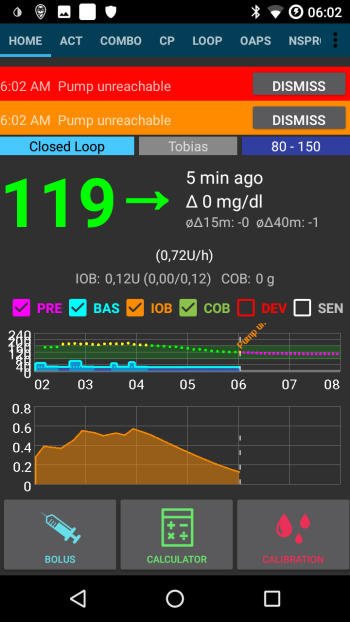 If you are tempted to just use the extended or multiwave bolus directly on the pump, AndroidAPS will penalize you wth disabling the closed loop for the next six hours to ensure that no excess insulin dosage is calculated. 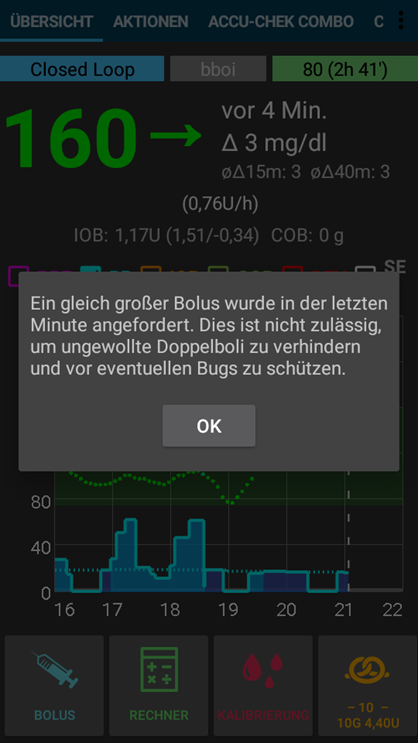 If AndroidAPS detects that an identical has been successfully delivered at the same minute, bolus delivery will be prevented with identical numer of insulin units. If your really want to bolus the same inuslin twice in short succession, just wait two more minutes and then deliver the bolus again. If the fist bolus has been interruped ot was not delivered for other reasons, you can immediately re-submit the bolus since AAPS 2.0. 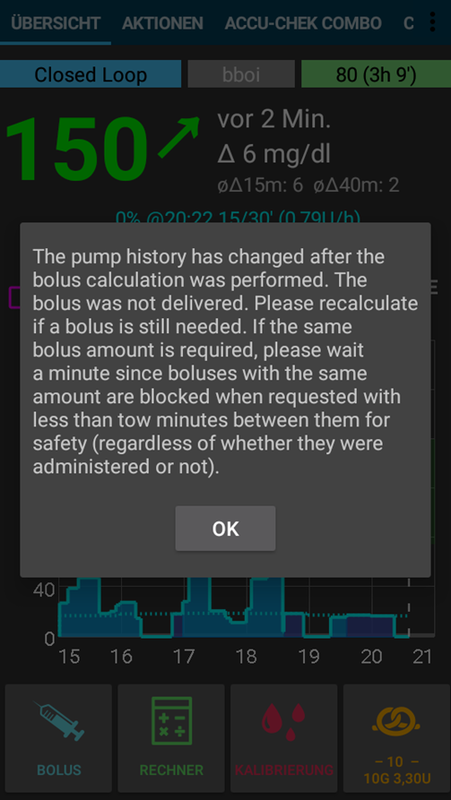 Background is a safety mechanism that reads the pump’s bolus history before subm,itting a new bolus to correctly calculate insulin on board (IOB), even when a bolus is delivered directly from the pump. Here indistinguishable entries must be prevented. This mechanism is also responsible for a second cause of the error: If during the use of the bolus calculator another bolus is delivered via the pump and thereby the bolus history changes, the basis of the bolus calculation is wrong and the bolus is aborted.